What is the average life span of a Great Dane? The average would be typically about 7 to 10 years. There are six recognised colours - Fawn, Brindle, Black, Blue, Mantle and Harlequin. Danes with colours or markings besides these six cannot be shown. Regardless of colour, all can make fine family pets. Be cautious of those selling 'Rare' colours. They can grow to around 39 inches / 100cm at the shoulder. Average male height is around 35", female height is around 30". Between 50 - 90 kilos. Breeding for extremes is not a sound practice, and responsible breeders do not select for these traits. The recommended diet varies from breeder to breeder, however most will suggest a well balanced diet, low in protein less than 26%, which generally consists of a premium adult dry dog food mixed with raw mince. A 15kg bag of dry food is generally around $100. A growing puppy can eat up to 8 cups of dry food a day. Do they require lots of grooming? What Health problems are associated with the Great Dane? Great Danes may be predisposed to certain health problems such as Hip and Elbow Dysplasia, Von Willibrands Disease, Wobbler Syndrome, Eye /hearing abnormalities (especially in predominately white dogs), Sports and/or weight injuries like cruciate ligament tears, Thyroid abnormalities, Bloating and stomach torsion, Irritable bowel syndrome, Happy tail injuries and Cardiomyopathy and other heart conditions found in Giant Breed dogs. Puppies and young adults can develop growing or bone problems which are sometimes associated with an improper diet. The most negative aspect of the breed is a short life span. What type of Temperament should a Great Dane have? A Great Dane should be friendly and outgoing. Great Danes are often referred to as Gentle Giants, but like all dogs require training. Are Great Danes easy to train? Great Danes can be aloof and stubborn but are perfectly trainable, many Great Danes compete in the highest levels of Obedience & Agility. You will need patience to train a Great Dane and a good sense of humour. Socialising and training is very important for such a large dog and should start from a very young age. Are Great Danes expensive to look after? They are often referred to as a deep pocket breed. They do require more food than a Labrador sized dog, vet bills and medications cost more as this is a Giant Breed. 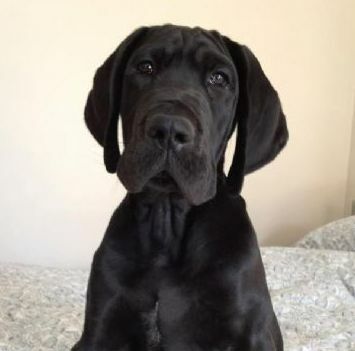 If you decide to bring a Great Dane into your home you will need to be realistic of the costs that can be involved in caring for a Giant Breed dog. Do Great Danes make good Jogging partners? If you would like a jogging partner you are better off getting a working breed type of dog such as a Border Collie. Adult Great Danes can be conditioned to run for longer distances but this does put strain on their giant frames so you need to make sure you work up to longer distances slowly. You should also avoid hard surfaces such as concrete. Do Great Danes need long walks? No, although each dog is different. Any adult dog may be happy with 15 minutes and another may be happy with 30 minutes where as more fit adult Danes may be happy with an hour walk. Dogs under 12 months of age should only have smaller amounts of exercise until their growth plates close. Can I take a Great Dane to an Off Leash Park? Danes, like all dogs, need to be socialised with dogs of all sizes and breeds. Many smaller dogs are frightened of Great Danes due to their size, you need to make sure they are OK with your dog prior to letting them off lead. Off Leash parks are only suitable to some dogs, if your Great Dane can play well with other dogs i.e. doesn't bowl them over, isn't rude and isn't aggressive then an Off Lead park may be suitable. Unfortunately many off lead parks don't have many responsible dog owners and you will have to watch other peoples dogs. Will a Great Dane be OK with my Children? Although Great Danes who have been raised with children are usually very gentle, they are much larger than a small child. Children must be taught the correct way to interact with a puppy and parents need to monitor correct behavior on the part of the child and the puppy. Well bred Great Danes have a gentle and loving disposition that makes them a wonderful family companion, although proper early training and socialization are very important. Dogs and children should never be left alone unsupervised. Are Great Danes OK with Cats and other small animals? Generally a dog no matter what breed needs to grow up with Cats and other small animals to learn not chase them. Great Danes were bred to hunt and the 'drive to chase' still exists in some dogs. If you have an adult dog that has never been around Cats then it may not work out too well.